I left off the last post with me heading down to Echo Lake to meet my friend after an AH-MAZING day of hiking and views. I wanted to split this post into two parts because what happens next is the magic of the thru hiking community and deserves to stand on its own as a shining example of why I hike long trails and how wonderful this hiking world is…this will be a lengthy one with some links in there to reference what I mention and it’s totally worth it! Let me start off with who I was meeting at Echo Lake. Four years ago, when I was on the PCT, I needed to hitch out of Tuolumne Meadows. Two women picked me up who I immediately clicked with and one of them was Chandra. Two weeks later, when I reached Echo Lake Chandra was able to help me once again with a ride back to trail and she hiked in a bit with me. We’ve kept in touch the last four years, and now Chandra was able to meet up again at Echo Lake. 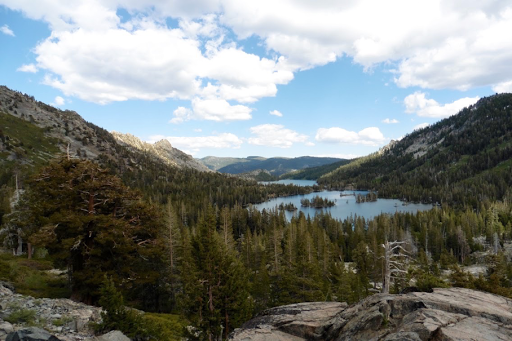 The plan for us hikers was to hit Echo Lake Chalet by 5pm to have time to get any resupplies or treats we needed before hiking on a couple more miles to a mosquito filled camp. The store’s source for water was dry, so they weren’t making the usual sandwiches we hoped to get for dinner, dang! At 4pm, I pushed on ahead of Rockin and Why Not to do the last few downhill miles to Echo Lake and get more time with Chandra. Just before we split for me to hike down, I checked my phone to see that I had a Facebook notification from fellow 2011 PCTer, Free Range Amelia. She was at Echo Summit Lodge with her family and wanted to say hi, yay! I was excited to see Chandra and Free Range and flew down to the lake. As I went down, I got a call from Free Range. Turns out that her family had rented out the entire private lodge for the week to celebrate her aunt’s 60th birthday. In 2011, I had hiked with Free Range in this section south of Echo. 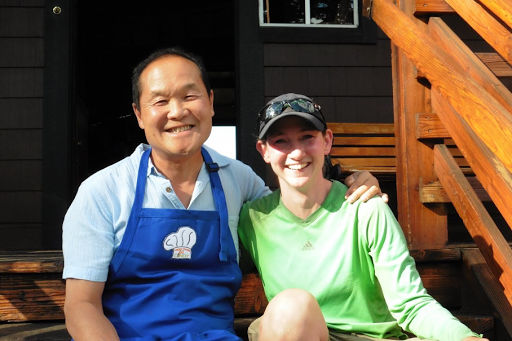 I remember her telling me about this lodge she was going to and her aunt who was an amazing chef. 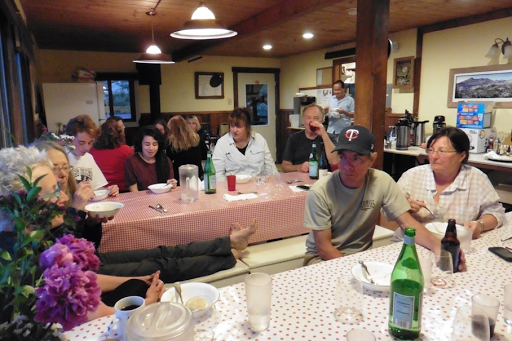 Well, just as fate would have it today, there was room at the lodge and all of us were invited for dinner…made by her five star chef aunt…and to stay in the lodge for the night! Pretty much the BEST TRAIL MAGIC EVER!! When Rockin’ and Why Not made it down, they were quite excited to hear this. Apparently, on the hike down, they were wishing for a lodge opportunity and concocting a plan to convince me to stay in a lodge if we could find one. Well, their wish came true! 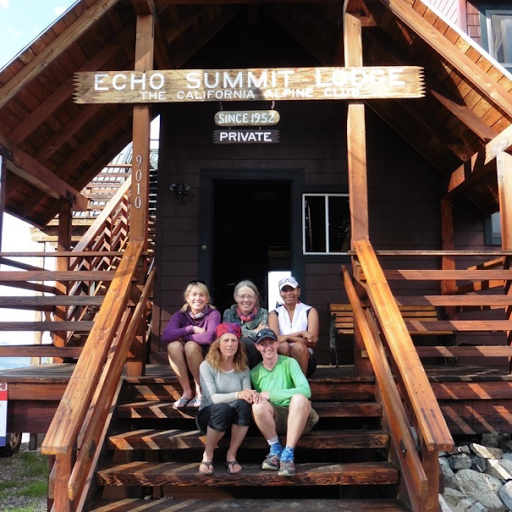 We all took a photo together and headed over to the Echo Summit Lodge just a short drive from the lake. It was beyond our wildest dreams that all this was happening. 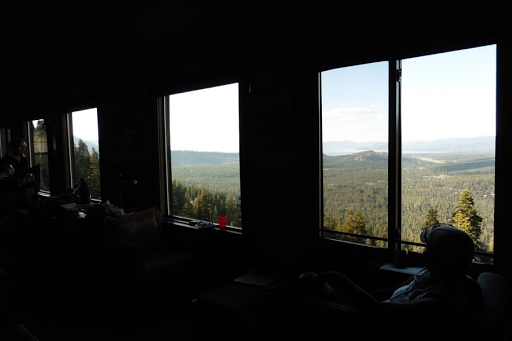 When we entered the lodge we walked into the main lounge area with a panoramic view of Lake Tahoe. Free Range gave us a tour and introduced us to some of the ~20 people from her family and some lodge members also there for the week. 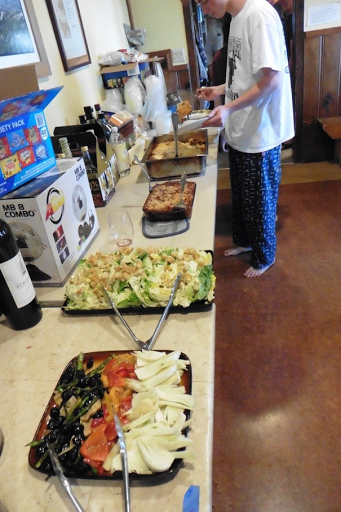 There were amazing appetizers already out to snack on and wine. We were taken upstairs to where we’d get a section to ourselves and each get our own bed and A SHOWER with quality shampoos and soaps. This family had gone all out for this week and they know how to celebrate in style! There are so many small serendipitous moments that made this whole experience even more magnificent. First off, Free Range and her family had just arrived yesterday. Free Range didn’t even know I was on the the TRT until her uncle John (who has followed the blog all these years since the PCT) mentioned that I was out here. Here I am with John who set all this in motion. John’s wife, Cindy, is Free Range’s aunt, who is celebrating her 60th birthday. She is the world renown chef that Free Range had told me about years ago. There was a theme for the week and you’ll notice the apron John has on. 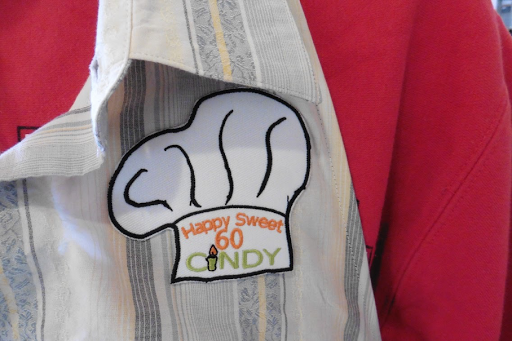 There were a variety of aprons with birthday patches on them for Cindy’s birthday. Her full name is Cindy Pawlcyn and she is a Master Chef that owns three restaurants in Napa Valley Mustards Grill, Monetary Bay Aquarium, and Cindy’s Backstreet Kitchen. She has written 5 cookbooks and has won a James Beard Award (like the Oscar of cooking) for her Mustards Grill cookbook. She was also on the Bravo reality show, Top Chef: Masters. Click here for Cindy’s official website . Never in my life did I ever think I’d be eating food prepared by a chef like Cindy! We showered and headed down to the most wonderful meal and company. Free Range’s family is just full of life, laughter, and light. There were three long tables to sit at and the family made sure us hikers all split up to different tables so we could mingle and talk to new people. 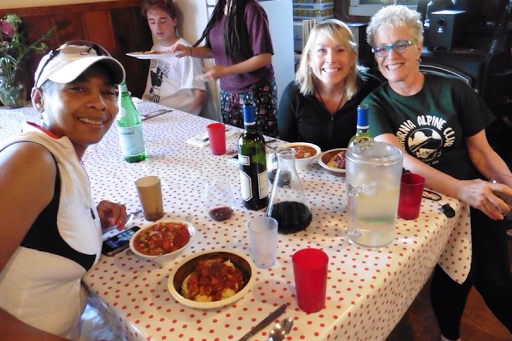 Cindy was even able to make Chandra and Rockin special dishes of gazpacho and polenta because they are gluten and dairy free and the main meal was lasagna. As a bonus, Chandra loves the cooking reality shows and had watched Cindy on Top Chef: Masters, so this was especially exciting for her. It was a wonderful lasagna! I don’t drink, but from what I heard, the wine was quite nice and there was a detailed description of where they originated. Dessert was ice cream, snicker doodles, and a cherry sauce…I ate two desserts. Just think they brought all this up in countless coolers to be able to cook all the meals at the lodge. It is obviously Cindy’s life and passion. I had the honor of sitting with Cindy and John at dinner. Oh man, what a wonderful evening! Just a year ago, Cindy and John were in a tragic head on collision car accident. That makes this 60th birthday celebration all the more significant. A small note that I just love is that Cindy’s glasses were uniquely blue and green. How perfect is that!? I think the most embarrassing question I answered for Cindy and John was what I eat on the trail. They did an excellent job of not looking disgusted because I know my diet is horrible! It was just such a boost to the human spirit to be around such inspired and passionate people. I got to sit in the back corner and see the whole room as everyone ate. To see the smiles of pure joy on the faces of everyone filled me. 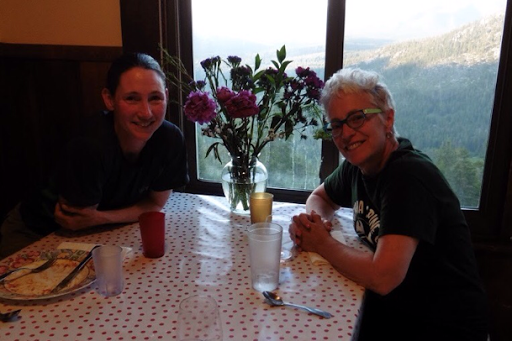 Another great serendipitous moment tonight…Why Not and Free Range randomly met briefly last year on the PCT while Why Not was completing her second thru and Free Range was doing a section. Rockin’ had not met Free Range yet and while at dinner I mentioned how Rockin’s blog, Lady On A Rock, was inspired by an older woman that Rockin met in the Sierra. The woman was sitting on a rock and was solo section hiking the PCT. That was the moment that Rockin’ realized she too could do the same thing. She started the blog and section hiking the PCT the next year. All Rockin’ knew of this woman was that she was a retired stewardess in Chicago. 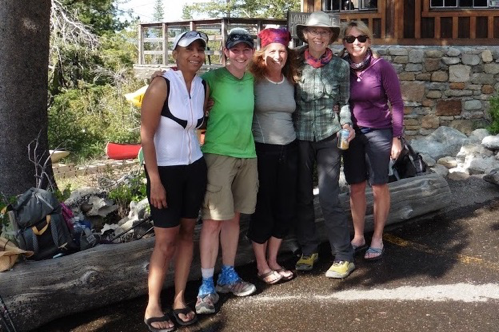 Well, two years ago, when we hiked some of the CDT together, a blog follower of mine looked at Rockin’s blog, and the description of the lady on the rock and he contacted me to say he knew who that woman was! Since then, Rockin has been in touch with the “Lady On A Rock” and has been able to tell her how her actions inspired Rockin to hike(who then inspired me to hike and blog). As I told this story, Free Range realized that she also briefly ran into that SAME WOMAN along the PCT when she was doing a shorter trip and that was one of two women on that trip that inspired her to hike the PCT. Such an amazing coincidence! Now Free Range can get in touch with that woman to tell her the influence their brief overlap had on her too. As you can see, this was quite the evening and intersection of many things and people on many levels. No words can describe what an evening like that did for so many of us in that room, but I just had to attempt to explain it. I am so fortunate to have gotten to share it with people who “get it” and who could also appreciate the little things. 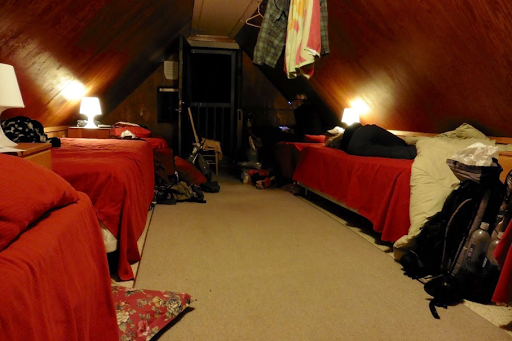 We were all happy and quite fortunate campers with very full bellies and even fuller hearts when we went to sleep well past hiker midnight…totally worth it! THANK YOU to Free Range, John, Cindy, and everyone else for making us feel like part of the family for a night. Just amazing!